There's one reason to travel to Guilin - Limestone. Take away all the limestone and you would have very little. Except a bunch of holes, I guess. 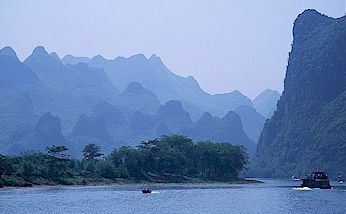 There are more than ten thousand limestone peaks in the Guilin area. Many of these have caves. Many have temples or pavilions. Almost all have names like Frog Crossing The River, Yearning For Husband Rock, Colorful Embroidery Hill, Chicken Cage Hill, or The Painted Hill Of Nine Horses. The only thing I can say about these names and their relation with the mountains that they are assigned to is that life must have been really, really boring a thousand years ago. Where was Looks Like All The Other Rocks Rock? Thank god we've got the internet now. The Li River might be the prototype for those 'moving sidewalks' we have in airports. It's a river that moves only marginally faster than you walk, but it makes life so much easier (keep to the right please). It moves at the perfect speed for viewing a couple of thousand limestone mountains, plus the occasional water buffalo. And it curves and winds just enough to keep you wondering what's around the bend. 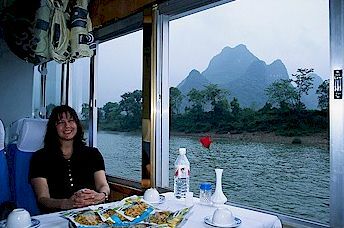 I'd like to tell you horror stories about how we packed onto a ten foot long bamboo raft with five thousand immigrants for a treacherous sail down the Li River, living only on fresh water snails and our wits - but only the part about snails would be true. The cabins were comfortable and spacious. The staff was accommodating. And the bathrooms were western (and clean!). There was plenty of room for everyone in the cabins and the viewing decks. It was great! If ever a river resembled a mobius strip, it must be the Li. Six hours of floating brought us 83 kilometers, but we might as have been back at the start for all we could tell. 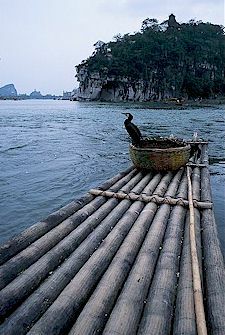 It was as though they had packed up all the funny shaped rocks, goofy cormorants, rustic bamboo rafts, and noisy carts selling English versions of Mao's Little Red Book and drove them to Yangshuo to be waiting for us. 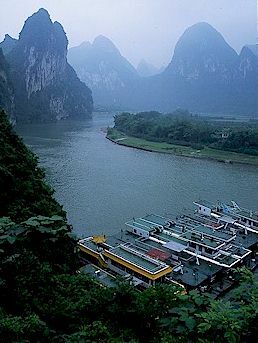 Yangshuo itself was very different from Guilin, but the river was an unchanging carousel. That's what I loved about it. The constant horizon of limestone crags is hypnotic. The peaks just unfold wave by wave. The sameness creates a relaxing rhythm, like taking a walk through a bamboo forest or watching clouds roll overhead. Six hours of rocks and water, water and rocks, might seem like a long trip, but it wasn't enough for us. We were back for more, two days later. What can I say? I was in the mood to name a rock.